Approved Document H of the UK Building Regulations sets out the guidelines needed for the construction of foul water drainage and rainwater or surface water drainage systems. It also sets out the rules for wastewater treatment systems, cesspools and tanks and also how solid waste should be stored. This also includes the design and construction of sanitary pipework for waste removal from the likes of baths, sinks, basins and toilets. During home improvements works such as the construction of an extension to a property, it might be discovered that a sewer is located on the site to to built on. Document H sets out the rules that need to be followed in this situation and how the sewer can be moved or adjusted. Drainage and waste removal from a building, whether it’s foul water or rainwater is essential regardless of the use of the building. In order to ensure that this is achieved in a safe and consistent manner Approved Document H sets out the rules that must be followed. Each section sets out the particular requirements needed in order to comply with Document H and also states any limits or exceptions there may be. When dealing with this section we first have to establish what foul water waste actually is. Foul water waste is water that essentially comes from sanitary conveniences such as toilets or bidets and also includes water used in the preparation of food or washing clothes (e.g. water from a washing machine). In most cases the majority of the above can be overcome through the design of the system and ensuring that the system itself is of a suitable size (including the size of pipework diameter etc….) to cope with the volume of use it will receive, but there are certain items that have to be included also. At any point where foulwater is discharged into the system a water seal trap should be included to prevent foul air escaping. Under conditions of use the trap should retain a minimum of 25mm or water. The trap itself should also be resistant to pressure fluctuations in the system and should also be accessible for clearing blockages. There are also rules governing the manner in which pipework branches and stacks can be used and connected and also how ventilation pipes feature within the system and also what systems can be used for larger buildings. For full details on these please refer to Approved Document H that can be downloaded on the link at the top of this page. Where a water treatment system, cesspool, or septic tank feature in the wastewater system for a building or property the rules also state that a permanent notice should be featured in a prominent position advising on how the should be run and maintained so that it remains at optimum performance and avoids any risk to health. There are quite a few rules and regulations in terms of what systems can be used and what single system needs to be used in conjunction with another and due to this you should refer to the official Approved Document H that can be downloaded on the link at the top of this page. When it comes to the drainage of rainwater from a property, this is highly important! If rainwater does not drain correctly from the roof, guttering system or from surrounding pathways or land then it can sit, soak into walls or cavities and cause damp issues that can result in many £000’s worth of damage. This section of the Approved Document ensures that any rainwater is drained away from a building in such a way that damp damage does not occur and that the water runs into either a soakaway, watercourse or sewer (in that order of preference). When it comes to paved areas this also falls under Approved Document M – sections M1, M2 and M4 1, 2 and 3 (access to buildings that are not dwellings, access to extensions to buildings that are not dwellings and access to dwellings). The rules also state that where rainwater harvesting systems are featured for the purpose of capturing rainwater for re-use, requirement H3 of the document does not apply. Due to the potential amount of differing roof types, drainage system types, water transfer objects (gutters and pipes etc….) there are numerous rules stating how drainage systems should be formed, what size they should be what materials they should be made from, what fall they should cover to ensure water drains correctly etc…. and because of this full details should be sought in the official Approved Document H that can be downloaded above. Sewers and foulwater drainage is essential to pretty much all buildings and in light of this it is very important that drains and sewers are not damaged during any construction works. In respect to this, section H4 of this Approved Document states that the construction of an extension, ground works or underpinning of a property should ensure that any existing sewers or means of drainage are not damaged or disturbed. The Sewerage Undertaker is responsible for maintaining a set of records detailing the location of sewers and drainage under section 199 of the Water Industry Act 1991 and these records should be consulted during the planning process of any of the above works to ascertain the presence of any drain or sewer. In the case that one is found or present you will need to consult with your architect, local authority and local authority planning office. This will also apply if the building works will affect access to the drain or sewer access point, manhole or inspection chamber etc…. During building works and where sewers or drains are close to the work taking place they should be protected from damage at all times from the work itself or from any heavy construction machinery that may be used. This can be done through using barriers to section off areas where drains exist. This also includes the possibility of settlement damage. In these cases pipework should be surrounded with at minimum of 100mm flexible filling or where there is the potential for excessive subsidence, flexible joints can be used to allow some movement. If a drain or sewer is found to be less than 2 metres in depth it is advised that the foundation is extended to allow the drain or sewer to pass through the wall. Additionally, the pipework should also be protected from damage or the chance of misalignment. Where a drain or sewer is greater than 2 metres in depth any foundation work above it should be formed as a lintel that spans over the drainage pipework with a minimum of 1.5 metres span either side of the pipework. As we have discussed, there are essentially two separate drainage systems with a building or property – the rainwater drainage and also the foulwater drainage. Section H5 states that these two systems must be kept separate e.g. rainwater drainage cannot drain into foulwater drainage and vice-versa. There are, however, some limits on this application in the form of H5 only applying to a system that is provided as part of the construction of an extension to a building or property where it is reasonable for surface water to be drained directly or indirectly into a sewer that is shown on a map of sewers or into a sewer that is being constructed by the sewage undertaker or another person. The above will need to be discussed with an architect and also with your local authority and planning office so that the most suitable system for the situation can be settled on. 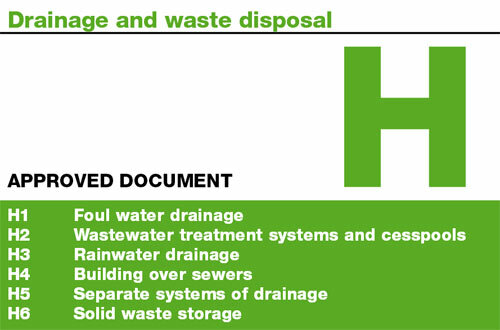 The final section of this approved document is concerned with solid waste, both storage and removal. In this context solid waste means household waste, bins etc…. Where applicable it can also mean collection of waste products that have resulted from water treatment (but this may not necessarily be covered by local authority). The rules state that suitable space and amenities should be provided for slid waste storage and also that suitable access should be provided for residents of the building to deposit waste and also access should be provided from the place of storage to a point where it is collected. It should also be noted that a collection point may be stated by the waste collection authority (under sections 46 and 47 of the Environmental Protection Act 1990). In the event that a specific collection point isn’t stated then waste for collection should be sited on a nearby street. The Waste Collection Authority also has the ability to state what type of waste storage should be used and also how many can be used. Although the storage and collection points for household waste recycling are not covered by this Approved Document, technically this does fall under section H6 so the general guidelines should be followed. It states that these two waste types should be stored separately. When planning any form of building or construction work it is essential that when referencing an Approved Document that you ensure you are referencing the most up to date document. In light of this the above is meant only as a guide and for the most recent rules and regulation you should refer to the Approved Document H that is available from the Planning Portal website on the link above.